Are you wondering whether the good weather is ever coming back? It is! And when it does, here is how to enjoy the warm summer days in-style, with our ideas and product recommendations on styling the coolest outdoor dining space. The Scandinavians practically invented cool contemporary and the monochrome palette of whites, blacks and greys look really great in a green, natural setting. The combination is pretty and playful, but also quite elegant and cool, and works for traditional backyards, rooftop terraces and back garden decks. Here we take inspiration from the beautiful people of Kinfolk, who can do country rustic, without making it look “barnyard country”, and some gorgeous Americana outdoor gatherings that will make you book the first transatlantic flight out. 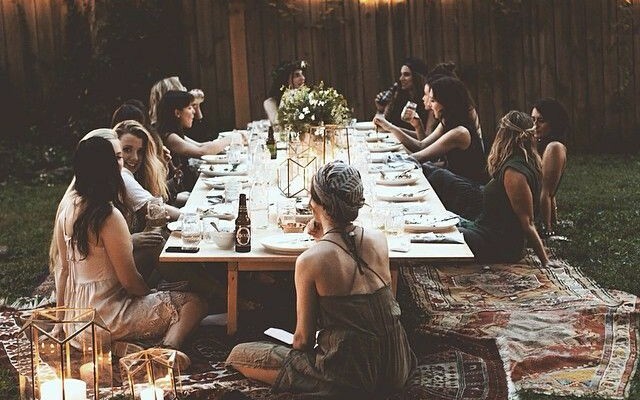 A friendly outdoor gathering, an open-air wedding, or just a regular night in (but outdoors)? Bohemian garden decor is the prettiest. Get a low table or put a number of pallets together, decorate with lots of colourful textile accessories, add some Oriental touches and mismatched dinnerware, and there you have it: your very own Arabian Nights outdoor party. Use cutting boards as serving trays for that warm rustic touch. And one less dish to wash.
Where there’s no fire, there’s no fun. Grill up your favorite vegetables and meats and get everyone to help. Decorate your outdoor space with lots of natural-texture, colourful textiles, festoon lights, flowers, greenery and candles. Recycle: old mason jars, lemonade bottles, zinc planters, raffia mats – these are the essential components of a laid-back outdoor gathering. Durability is key: everything from your seating pads to your dinnerware need to be break and weather-proof. Shade and shield: a weatherproof umbrella will keep you both sunsafe and dry; and have blankets at the ready. Because you live in Ireland. Make everything ahead (some recipes here) – except for the fireside cooking extravaganza – and concentrate on cocktails only for the rest of the night. Posted in Food, InteriorsTagged garden, homewares, interiors, outdoorliving, portfolioBookmark the permalink.